I was surprised to learn when eating fortified oatmeal; our bodies don’t absorb all the IRON it has. So, in order to help our bodies retain the iron in oatmeal, we need to consume ORANGE JUICE along with the oatmeal. So tried this combination of oatmeal cooked in milk and orange juice. • Bring milk to boil in a sauce pan. • While milk is boiling prepare the lemon slices. Cut it in half across its mid-section, then take knife and slide it down each side of every segment. This makes easier to spoon out. • When the liquid begins boiling, add oats and reduce the heat to medium. 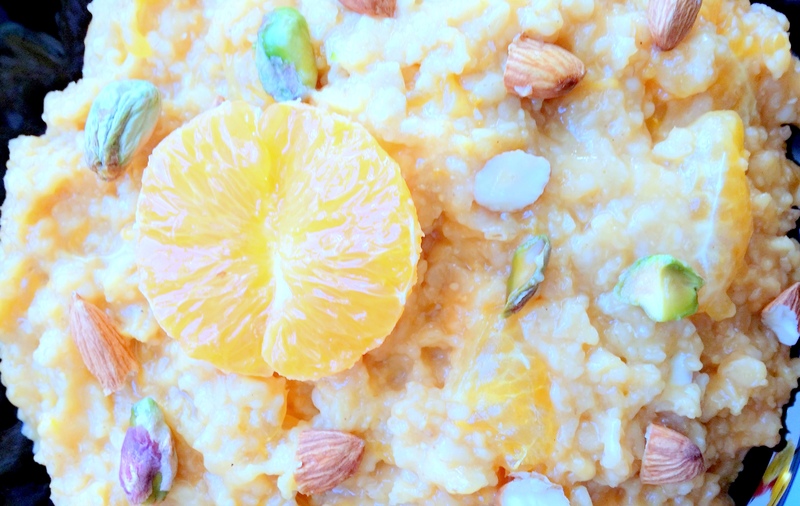 • Spoon out the orange segments add it to oatmeal, add orange juice along and stir. • Wait again for the liquid to absorb , then add cinnamon, nutmeg powder, pinch of salt, and mix well. • When your pleased with the consistency of oatmeal transfer to a bowl. Serve with another splash of milk, sliced almonds, shredded coconut or any other additional toppings. • For different serving ideas can use peach or any other fruits of your choice. Posted on April 18, 2014, in Breakfast, International, Kids recipes and tagged breakfast, drchdietfood, Oatmeal, oats, Orange, Porridge. Bookmark the permalink. Leave a comment.